Harecroft is one of the new suppliers of kits at the less expensive end of the market – as laser cutters and 3D printers have come down in price, it’s become possible to produce kits almost in a home workshop environment. This particular enterprise is run by Matt Nunn, who has been around for a fair number of years and has now turned to kit production as a way to bolster his finances whilst at uni – a most praiseworthy enterprise! 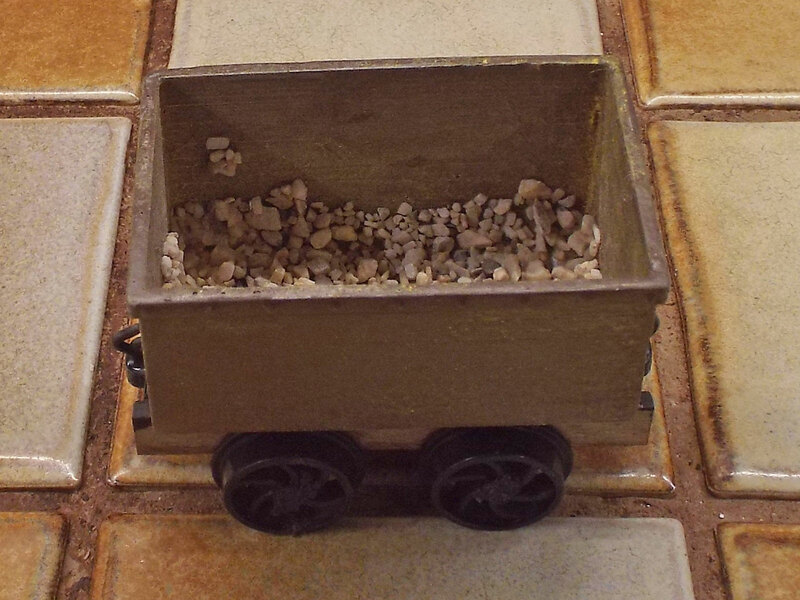 The two kits I bought were TTW (stands for Threlkeld Tub Wagon) and BFMT (stands for Birkhill Fireclay Mine Tub). 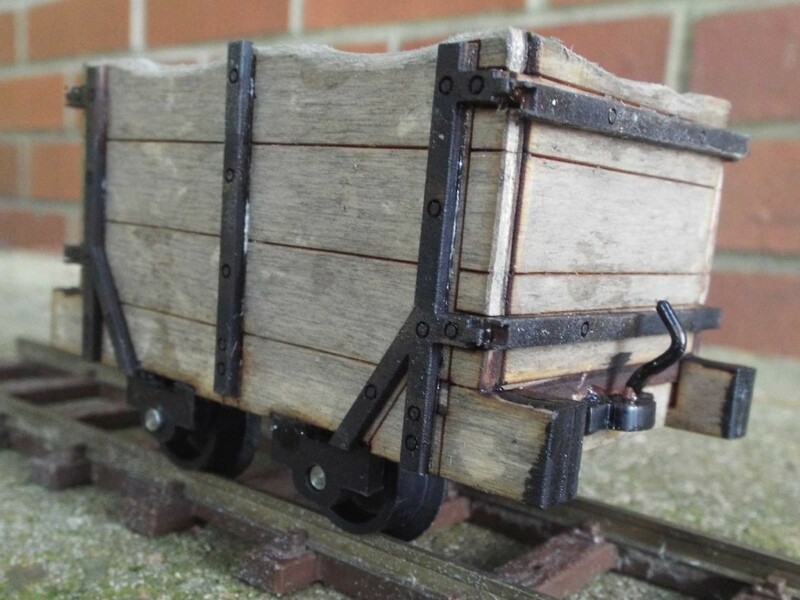 They are marginally more expensive (at £18 and £15) than the REALLY cheap wagons you CAN get, but unlike them, these are Scale Models of Real Wagons™ and there is a picture of the prototype in the instructions, together with an historical note. There is also considerably more detail than on the dead cheap models, which accounts for the slightly higher cost. 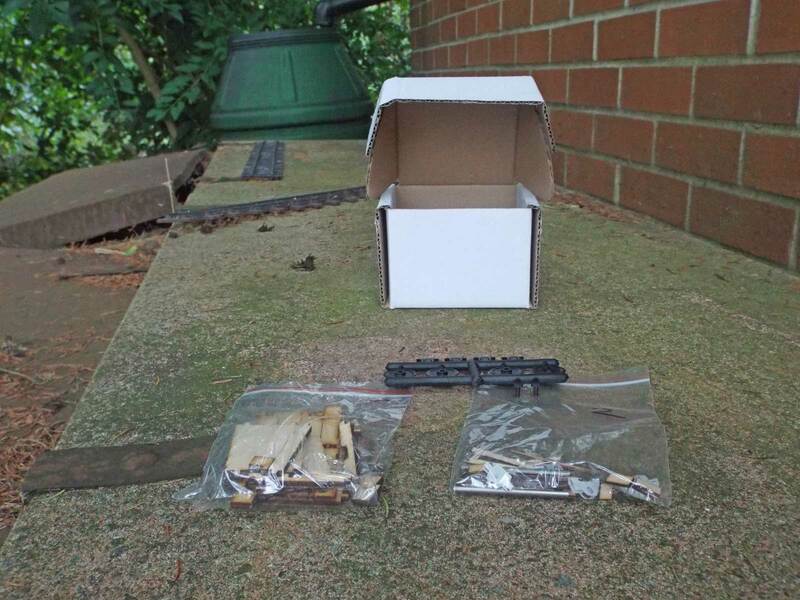 The kits each come in their own stout cardboard box, which will be well able to stand the worst that the Post Office or a courier firm can throw at them. 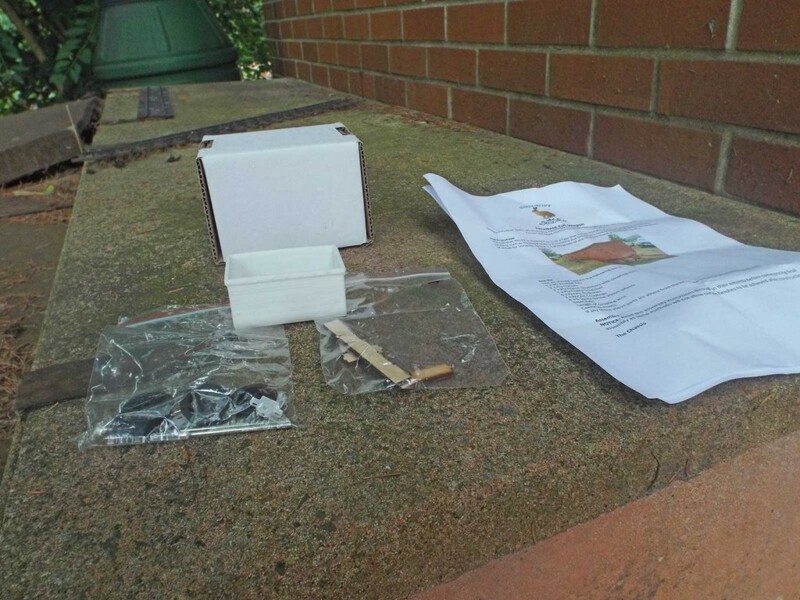 (Of course, you could also use the box to store the completed model….) Inside, you will find two bags, labelled “1” and “2” plus (in TTW) a 3D printed tub, the ubiquitous Binnie wheels and comprehensive instructions. The instructions refer to building the contents of each bag, so this is a very sensible way to split the kit up. 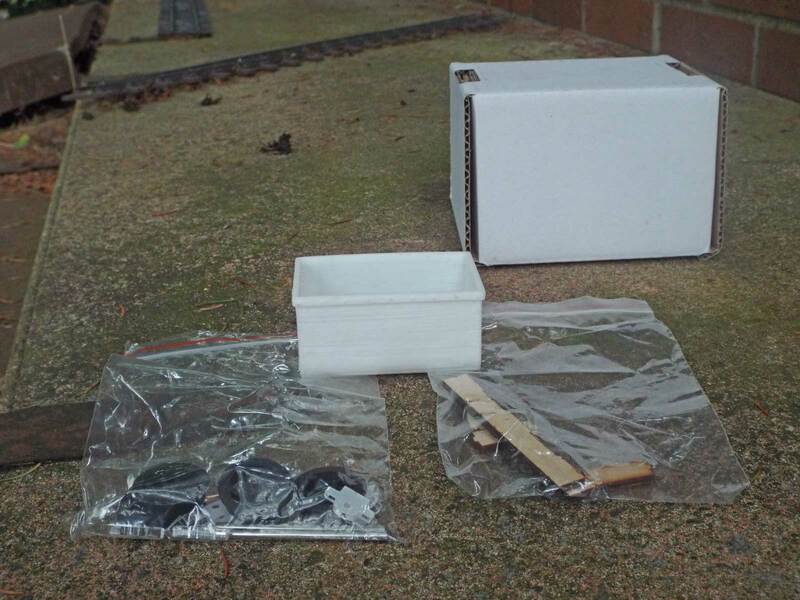 The first stage is to build the simple underframe in Bag 1. There are three tabs on each crosspiece (two with slots for the coupling on, and a plain one for in the middle) and three sockets on each of the solebars: the latter are only cut down one layer of ply, so there are no visible joins on the outside – a neat touch which I like very much. 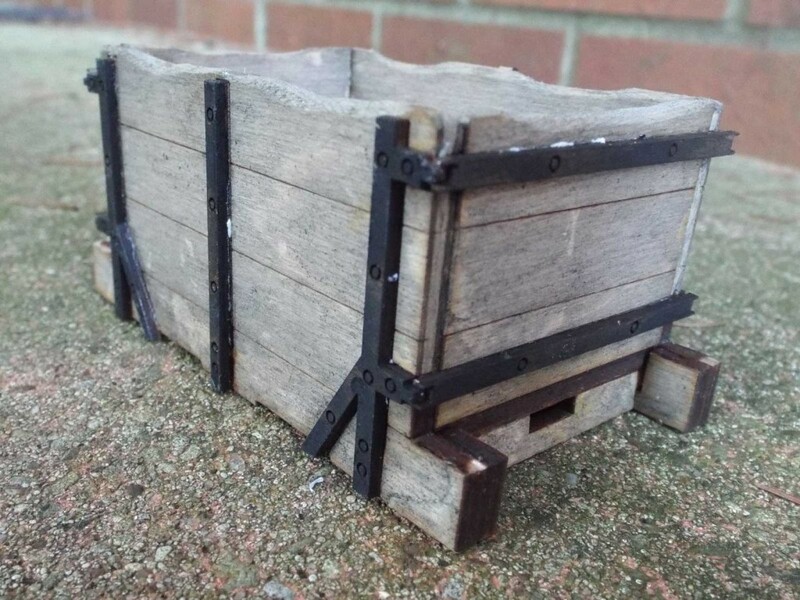 Once I’d scraped out the sockets – only a small amount needed along the bottom of each slot – and everything had been test fitted, I assembled the joints with PVA – doing this on a sheet of glass or other level surface is recommended. I then put a clamp on and laid it aside to dry. Staining the chassis (with VERY dilute Indian ink) was easy enough, but time-consuming in my case – peeling the plastic film off the axle bearings and couplings was more difficult. Be careful you don’t accidentally drop these… Putting them on a length of wire and spray painting them was a little fiddly, but the job was done. Matt suggests putting the axles (with wheels) through the axle bearings, then gluing them in place on the chassis with paper to stop the glue getting where it shouldn’t. I decided on a different method: put each axle (with one wheel on) through the bearings, then glue the latter in place (in my case, with 5 minute epoxy). Doing things this way, you can align the bearings correctly and leave everything “loose” until the glue’s gone off: adding the other wheel and re-gauging to 28mm b-t-b is simple enough, as is cutting the axle to length. Incidentally, I decided not to weather the wheels. The tub was a different matter. This 3D printed component looked incredibly “rough” as it came out of the box, with lots of unattached “strings” from the printing process, both inside and out, and the expected rough finish underneath. My first instinct was to reach for the Dremel (other high speed cutting / grinding machines ARE available) with a sanding drum to fetch these off. A needle file was used where the Dremel couldn’t reach and then I smoothed the sides and ends on the outside off with a normal DIY sanding machine. Then, I read the instructions……… which tell you how you can soften the surface to smooth out the roughness. A coat of high build primer followed, which left the body looking suitably rough. A coat of “Sleeper Grime” paint was applied……….. followed by some weathering powder. The bottom of the inside of the tub was still very rough, so I added a layer of fluorspar to hide it. 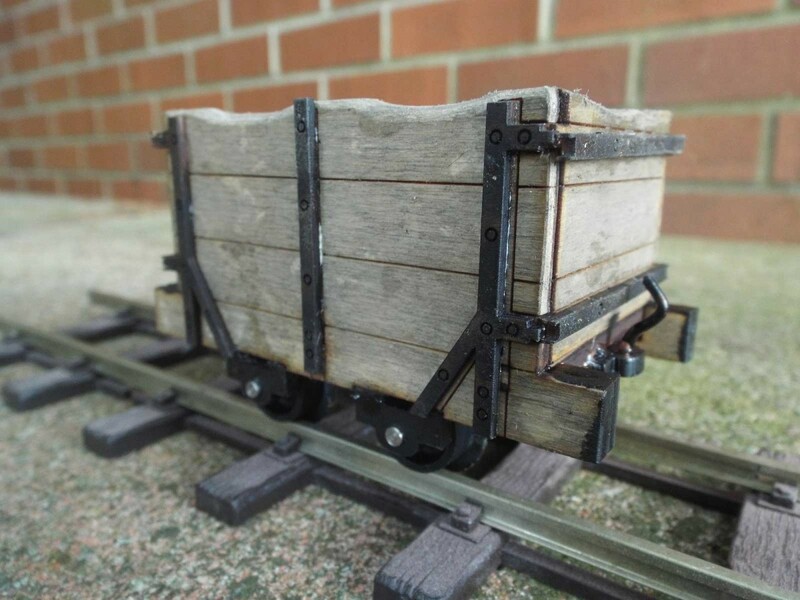 This kit follows the same pattern – Bag 1 contains the main structure of the wagon (sides, ends, floor, central cross-piece, coupling carriers and frame extensions) whilst Bag 2 contains the rest – strapping, axle bearings, couplings. Building Bag 1 was not difficult – the suggestion on where to put the glue was useful. 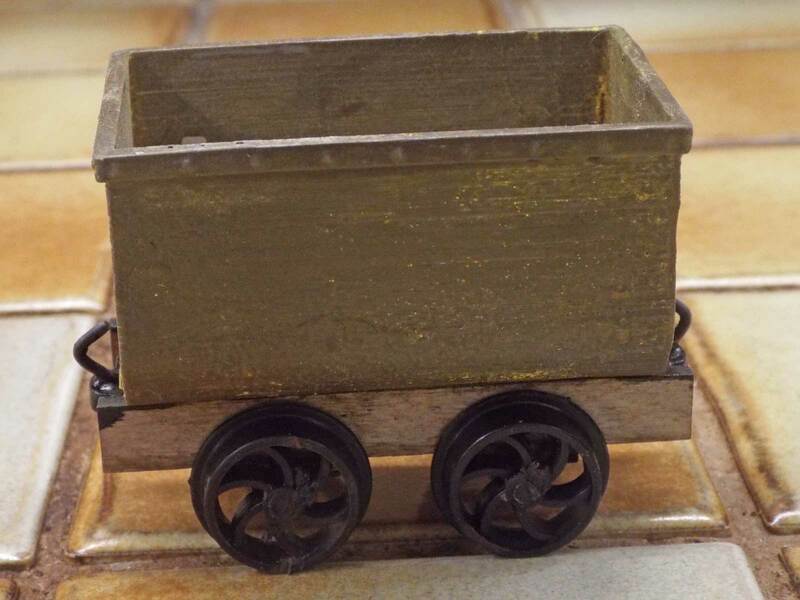 I decided to distress the top edges of the sides and ends, to make the wagon look “used”. Once the glue had gone off, I stained the completed assembly, carefully stuck the remaining parts to a long piece of wood with carpet tape, and sprayed them all matt black. 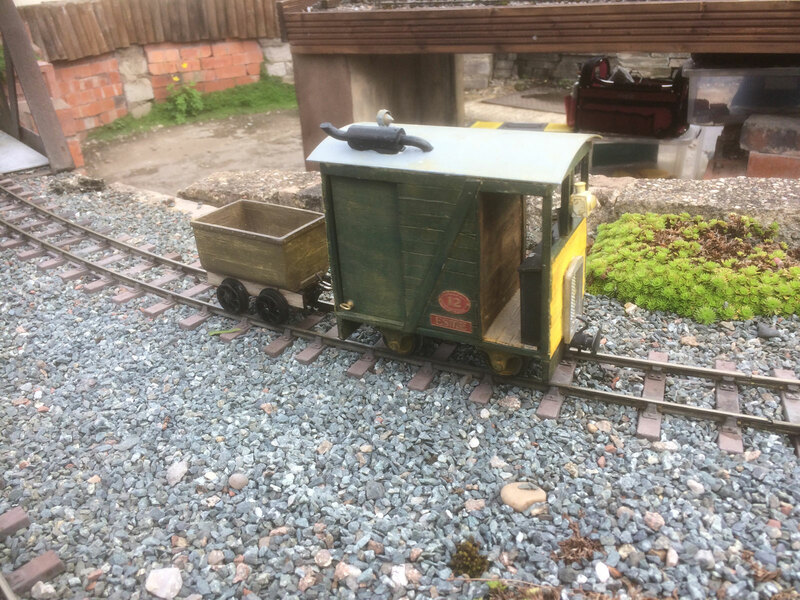 Once the paint was dry, I carefully removed the strapping and other bits and started to stick the strapping to the body, using Alphatic glue – something I’ve had in stock for AGES but have hardly ever used. It was at this point that I discovered Matt’s Cunning Plan – the strapping covers all the places where the locating lugs to hold the body together show, resulting in a model with no visible means of holding it together. The final three jobs were to glue the pedestal bearings in which the axles run in their locations in the underframe, using the axles without wheels to ensure alignment. At the same time, the couplers were glued in the ends of the underframe and fitted with hooks made from the wire supplied. Once the glue had (as Her Majesty would say) “gorn orf” it was possible to remove the axles, clean the axle holes (with a drill) and the axles themselves (with a combination of fine wet-and-dry and thinners) of any glue before fitting the wheels, sliding the axles into the bearings and setting the back-to-backs. 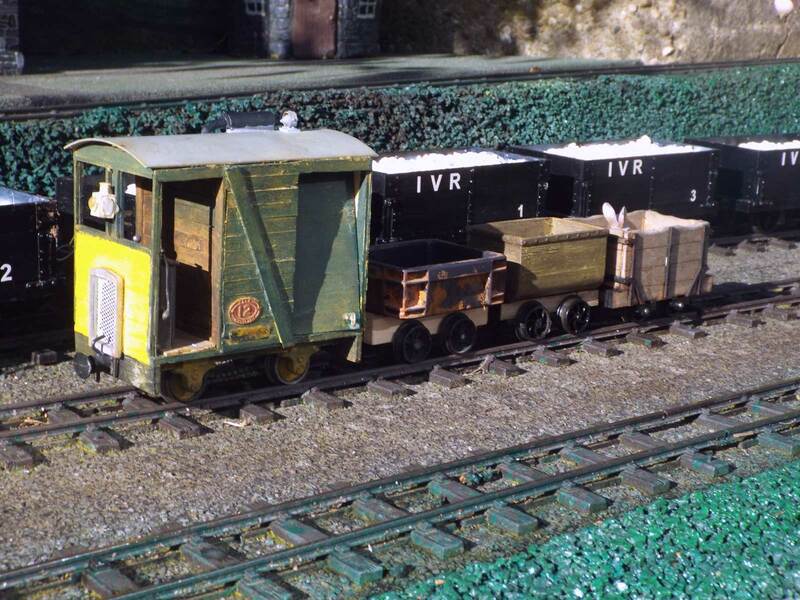 These kits make delightful little wagons. They are well thought out and the results justify careful assembly. The two wagons (plus one other) wait their next turn on Neville Brown’s Inham Valley Railway in Nottingham. The MDLR’s Killer Bunny is hitching a ride.